The ANITA Mk 12 was the first ANITA with the now standard 10-key keyboard. It was introduced in 1966, before the Mk 11, and used transistors as well as a Dekatron and cold-cathode tubes. "Several of the research achievements of 1966 are illustrated in the report. 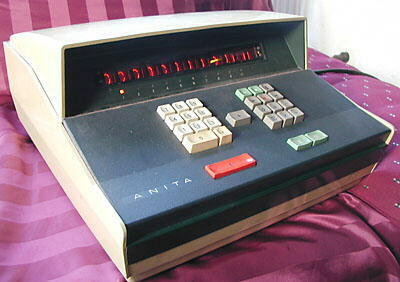 Foremost was the introduction of Anita Mark 12, a simplified keyboard electronic calculator designed in the first instance for the continental market, and now coming into production." This suggests that the 10-key machine was favoured in continental Europe but the full-keyboard machines (the Mk 8 and Mk 9) were more popular in Britain. Price in 1968: £480 (about US$1,150). "A 10-key, three register, two store, Electronic Desk Calculator. Unique active registers allow an economy in design, giving performance equivalent to comparable four or five register equipment. Any calculation can be re-traced to check and recall both products and quotients. ANITA'S unique method of calculation and ring decimal point gives a continuously usable capacity of 10x10x11 and prevents any possibility of "overflow" on multiplication, no matter the size or number of the factors. Positive balance feature permits a change of sign of any intermediate or final result. Transfer of information between registers is obtained by use of the interchange control effecting maximum flexibility of operation at all times. Additions to, or subtractions from, stored information are standardised automatically to any pre-set decimal point position so that there is no need for entry of any non-significant zeros. Fully symbolised and colour coded keyboard is completely international in design and easily understood. All cross register arithmetical operations are immediately available. Direct access to internal stores at all limes. Automatic clearance on reading totals from internal store prevents operating errors. Special interlocked control sequence permits these totals to be retained when required. 2 Fully automatic floating decimal point system. 4 Accumulated results can be used as multipliers or divisors without pre-setting or cross register operations." Roland Huisman has posted a fascinating video on Youtube with a demonstration of the internal workings of his restored ANITA Mk 12 at https://www.youtube.com/watch?v=dKAyLnBjS3Q&feature=youtu.be. This is recommended viewing to see how this machine which is intermediate between tube and transistor technology worked. 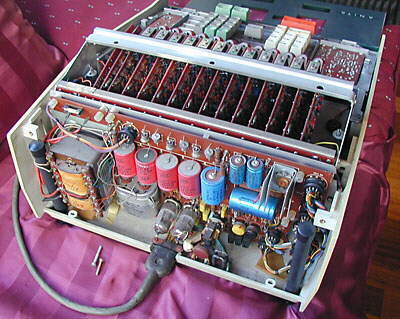 The arrangement of the electronics inside shows similarities to the earlier models, with each display tube being mounted on its own plug-in board. 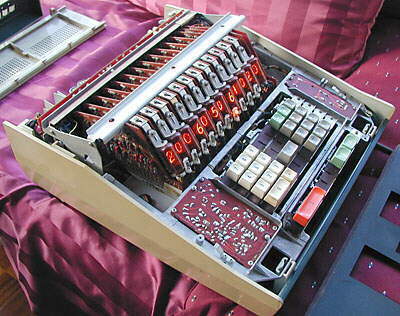 The circuit board at the rear of the calculator carries two vacuum tubes. One of the display boards removed from the calculator. This uses transistors and carries the display tube on the right. 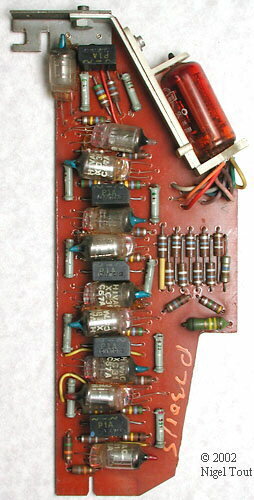 Compare this with the display board from the Mk 8 calculator, below, which uses cold-cathode tubes. 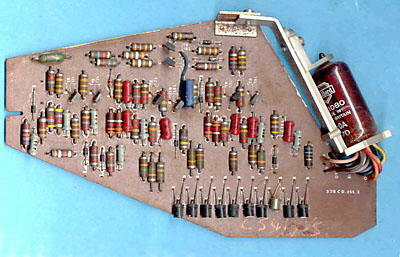 Display board from an earlier ANITA Mk 8, shown for comparison with the one from the ANITA Mk 12, above. The Times, April 6, 1967. "Focus on ANITA", advertisement, Office Methods and Machines, June 1968, p41. "NOW - ANITA MK 12", advertisement, Office Methods and Machines, October 1966. Origins of Bell Punch Co. Text & photographs copyright © 2002 - 2019 Nigel Tout, except where noted otherwise.